The Virginia Sexual and Domestic Violence Action Alliance seeks to build local sexual and domestic violence agencies’ capacity to identify reproductive and sexual coercion. 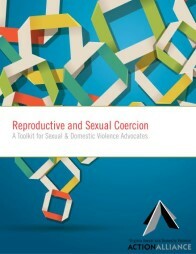 This includes: implementing screening for reproductive and sexual coercion, implementing policies and procedures that address reproductive and sexual coercion, fostering partnerships with family planning and reproductive health providers, and doing the above-mentioned work through a reproductive justice framework or lens. The goal of this toolkit is to help begin conversations and implement new or clarify existing policies within your agency: What is reproductive and sexual coercion? Why is a reproductive justice framework necessary? How can we best support survivors of sexual and intimate partner violence with a better understanding of reproductive and sexual coercion? What are sample policies and procedures my agency can utilize? Who in my community can I collaborate with on this work? We hope this resource provides some answers to these questions while also guiding and supporting further learning on these topics to best support the specific needs of your community.